Usually comparing countries or regions requires looking at GDP growth data, GDP per capita, living standards, relative income or even the happiness index. 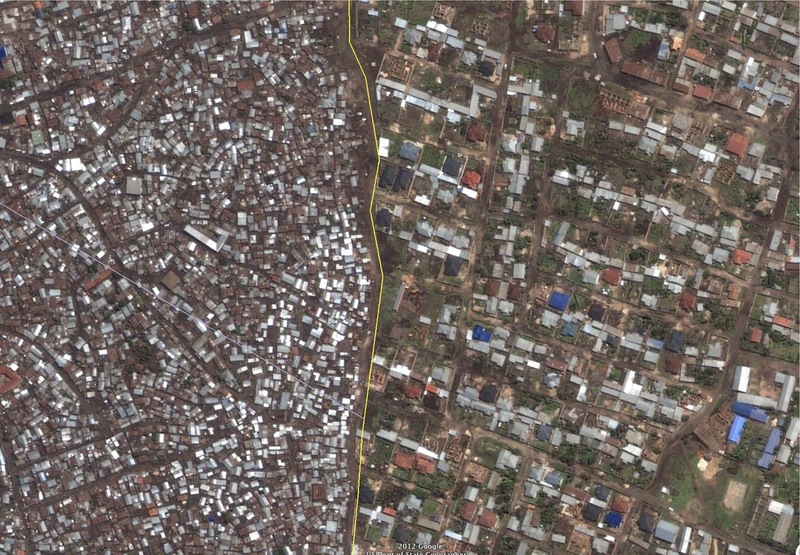 But even a simple areal glimpse at the borders separating two systems can be more than enough to conclude which country is richer, healthier, more educated and on average more prosperous. It tells us that the causes of between-country differences have to be more than just climate, geography, culture or mentality. Particularly when the same nation is separated by nothing more than a border depicting the striking differences in political systems of the two countries (a classical example here are East and West Germany, but an equally good example can be North or South Korea). As a result I found that the following set of images paint a better picture on between-country differences than any existing data on global inequality. The first one is from a blog post I encountered on the Why Nations Fail blog, comparing the cities of Gisenyi, Rwanda and Goma, DR Congo. 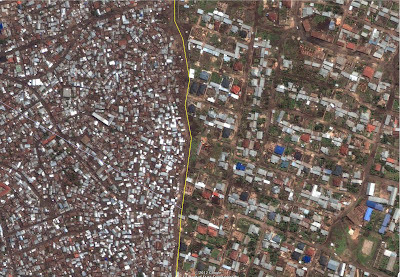 One would be surprised to learn that the right hand, decent looking side of the city is in Rwanda, while the left hand, chaotic side is in DR Congo. After all, Rwanda experienced a horrifying genocide in 1994. But both were hurt during the Great War of Africa, 1998 - 2003, fought mostly on Congo's territory. "The Rwandan side is very orderly. The streets are clean even if not all tarmacked. The drivers of motor cycle taxis...wear a helmet and carry spare ones for their passengers. Drivers drive beneath the speed limit and policemen do not ask for bribes. There is electricity and running water...But Goma is like a different planet. As the next picture shows...the chaos on the DRC side of the border is readily evident. To get into Goma you have to pay “du sucree” the Congolese phrase for a bribe and you have to pay more to get out. The town has a faded grandeur, but electricity, water and basic services are erratic to non-existent." "...political centralization is key not only for the development of inclusive institutions but for even the most basic form of growth under extractive institutions, and the orderliness and the economic revival in Rwanda since 1994 are both due to this type of growth under extractive institutions. But Rwanda also illustrates that political centralization can also have perverse consequences, particularly when the state turns genocidal." In Africa, centralization in order to achieve and maintain political stability is the starting point of moving forward. Those African countries that lack basic centralization can turn out to be even poorer and more disorganized than countries like Rwanda (whose GDP p/c PPP is a mere $1,300). This encouraged me to think further and I immediately remembered an excellent picture from National Geographic on the deforestation in Haiti as compared to Dominican Republic. Property rights tend to be much better defined in the Dominican Republic, obviously. Dominican Republic is hardly a paradise in private property ownership, but their GDP p/c is 9 times of its neighbour sharing the same island. And it shows. 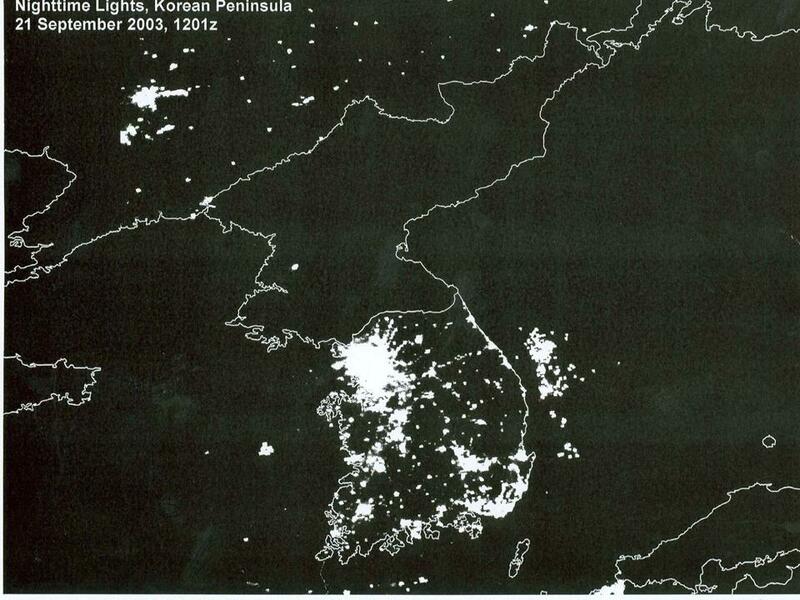 Then came the most famous (and most obvious) example – Koreas in the dark. 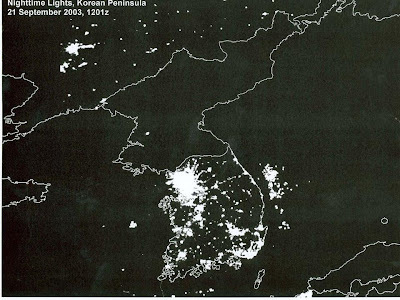 After 10 o'clock, it’s bed time for North Koreans. The difference? One is a highly extractive communist dictatorship with no personal freedom whatsoever, while the other is a democracy ranking high in both economic and individual freedom for over 6 decades. Again, the results are obvious. 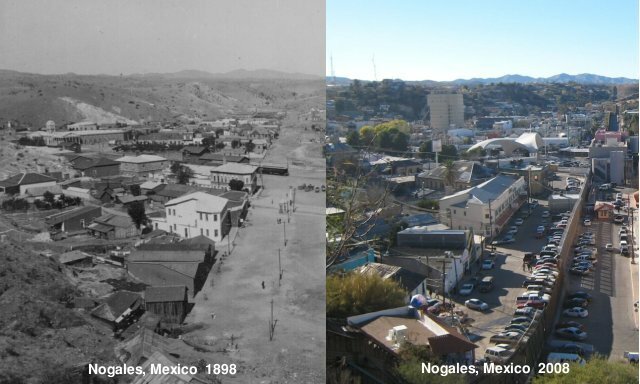 And finally, Nogales, the city depicted in the beginning of the book “Why Nations Fail”. 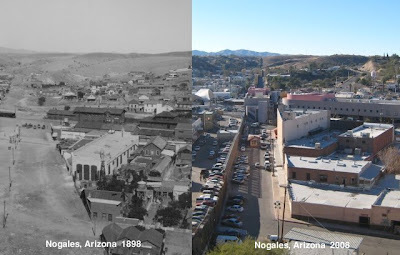 Take a look at the differences in the US part and the Mexian part now and 110 years ago. The Mexican part has hardly changed – we see more or less the same buildings still holding on, with only a bit more houses built in the landscape and one skyscraper. I assume it’s a residential skyscraper. On the other hand, the US part has changed significantly. Not a single building is the same as before, a highway was built coming in from the north, and the whole town seems much higher. Again, one can hardly call Nogales, AZ the prime example of US success. The city is nothing special. But even then one cannot shake the fact that people living on this side of the border are much better off than the people on the other side. On average, of course. Also, one other important thing has changed – just look at the size of the border. There wasn't even a fence before. Now it’s a 10-foot wall. That too can say a lot about the development paths of one country as opposed to the other. I'm not sure about the other examples, but the reason Haiti is much poorer than Dominican Republic even though they "share the same island" has a lot to do with climate and Haiti's relatively unfavourable geographical position. 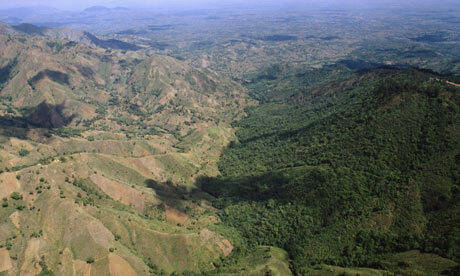 Haiti gets much less rainfall which creates problems with cultivation, which can explain the reasons behind its drastic deforestation. Deforestation has further destroyed farmland soil and made them even poorer than before. This is strange as both countries live on the same island, but the eastern part of the island is actually a much better location. I'm not saying this explains the entire difference between them, but it does explain much. I was never a big fan of the whole geography or climate argument, no matter how disadvantaged some country may seem to be. Think of countries like Switzerland, Iceland, Scandinavian countries, Baltic countries etc. They all have a much worse geographical position than Mediterranean countries, but that doesn't make them disadvantaged. On the contrary. England was full of moist, rough climate and all sorts of diseases in the Middle ages, but that didn't stop the Glorious Revolution. Japan is a much more recent example - very low on natural resources, stricken by earthquakes, tsunamis and monsoons, but this didn't prevent them from development - the same argument can be applied to Taiwan, Korea or Hong Kong. The point is, politics and the role of government make a difference and determine future success of a nation. Climate can be more or less helpful, but it certainly doesn't determine the final outcome. I would assign it only a small, small weight. In fact, I would rather call it an excuse for poverty, rather than a cause. That argument is unconvincing. Haiti is a basket case because it is a kleptocratic tribal culture which has always been brutal and violent. They will never be any different. Certain cultures are beyond any help. And please do not accuse me of Racism. It has nothing to do with race, it is Culture. In the same way, I am willing to take odds that the Russians will never ever have anything but a strongman running the show, That is all that culture has ever had and it is resistant to anything else. Cultures can change over time but some are very resistant. I agree, it all depends on a country's political (formal) institutions and how these shape mentality and culture (or informal institutions). Studying this info So i am glad to exhibit that I have an incredibly excellent uncanny feeling I discovered exactly what I needed.